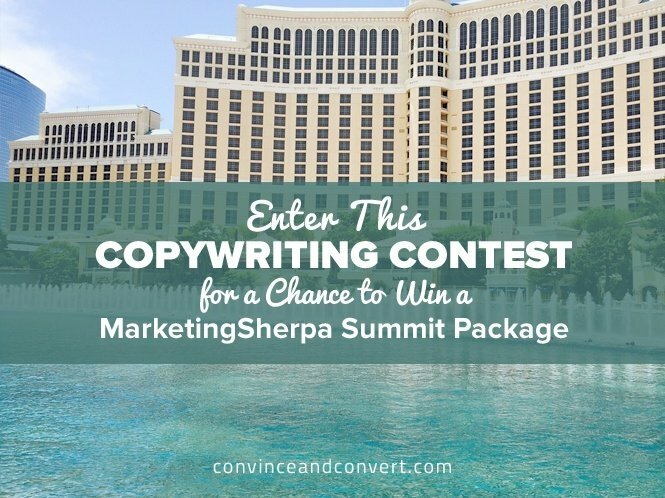 Enter This Copywriting Contest and Win a Free Trip! It’s our fourth annual copywriting contest, and the MarketingExperiments blog has partnered with Convince & Convert for this year’s copywriting challenge. We’re on the hunt for a copywriter or marketer to help a nonprofit organization that has spent the last 80 years battling in the public and private sectors for safer products and fair market practices. Write the most incredible, effective, and compelling opening to the Treatment email that best expresses your chosen Value Focus. It could be three words, or it could be three pages. Whatever you think will work best. The team from MECLABS Institute (parent research organization of MarketingExperiments and MarketingSherpa) will pick the top three or four entries that we think have the most effective copy, and test them on a real audience pulled from Consumer Reports’ email lists. Even if you don’t win, you’ll gain valuable insight from this very public experiment—including some new split testing ideas that you can use to improve your own marketing results. Curious about the testing methodology the MECLABS team used to create the experiments for this test? Read more about your “client” for this assignment below. Consumer Reports is a nonprofit organization supported by over seven million subscribers, activists, and donors. It conducts state-of-the-art product testing in its in-house laboratories and fights for consumer choice, safety, and fairness in the marketplace. Formed as an independent, nonprofit organization in 1936, Consumer Reports serves consumers through unbiased product testing and ratings, research, journalism, public education, and advocacy. 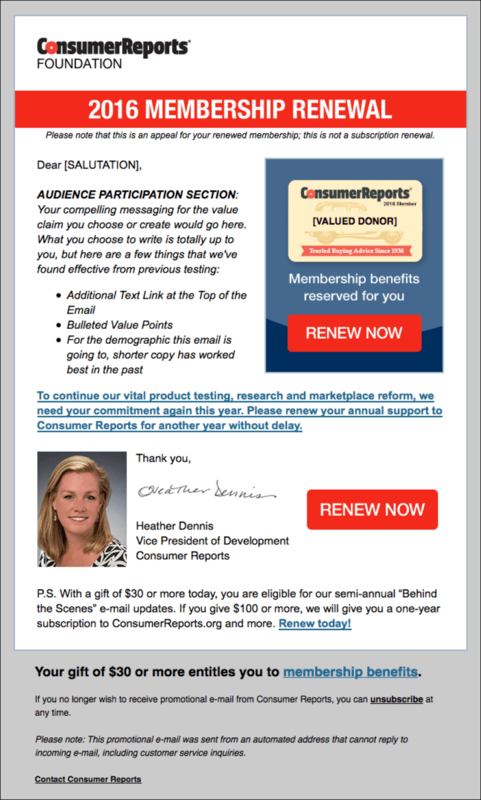 “[In] 2016, for Consumer Reports’ online fundraising, we look to continue to grow revenue. Since 2013, we have grown from $800,000 a year to looking at over $2.7M this year. Our challenges, though, are how to keep up with such great growth, and this test will hopefully help us find another approach to increasing revenue,” says Bruce Duesterhoeft, Program Manager of Online Fundraising for Consumer Reports. “We hope to learn from other marketers who can give insights with both their ‘e-marketing’ hat on and with their ‘consumer’ and ‘potential donor’ hats on. What resonates with them? What would make them decide to give a contribution to Consumer Reports?” says Dawn Nelson, Director of Fundraising for Consumer Reports. Every successful marketing test should confirm or deny an assumption about the customer. You need enough knowledge about the customer to create marketing messages you think will be effective. 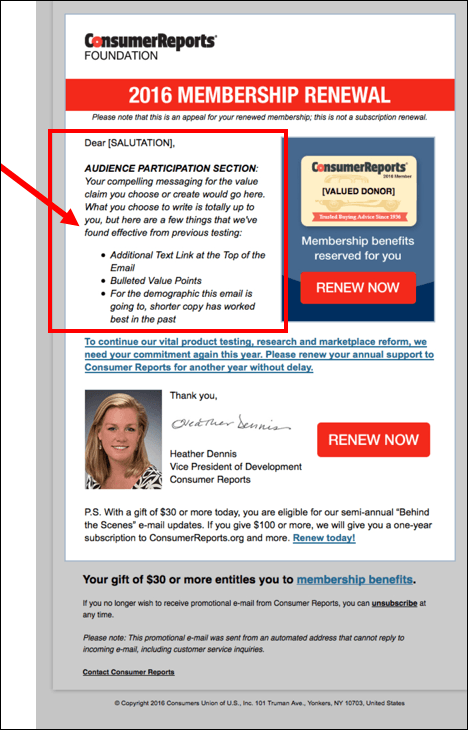 That’s why, for this public experiment to help marketers improve their split testing abilities, we have a real customer to work with: donors to Consumer Reports. To help you better understand the customer, our Marketing Intelligence team created the ConsumerReports MI Research. Sure, you can learn something and improve your marketing results somewhat with just one A/B test. But the most effective way to use A/B testing is to build a customer theory. Each test should build on the next to help close the most critical gap marketers face: truly understanding what customers want and how they want it. “In order to gain an understanding of how many treatments we can run, we had to estimate the minimum sample size for the January test. The data points used to calculate this were email list size, baseline clickthrough rate, and minimum relative difference that we are aiming to detect,” says Jordan Baker, Data Manager for MECLABS Institute. Using the data and assumptions below, Jordan estimated that we could test five email approaches (one control plus four treatments) and identify the most effective treatment with a 95% level of confidence. Plus, you get to help with Step 5. Craft clear messaging to potential donors that expresses a Value Focus (the element of all the possible value you provide to ideal customers that each segment finds most compelling). When you submit your entry in the comments section, let us know which Value Focus you are writing copy for. 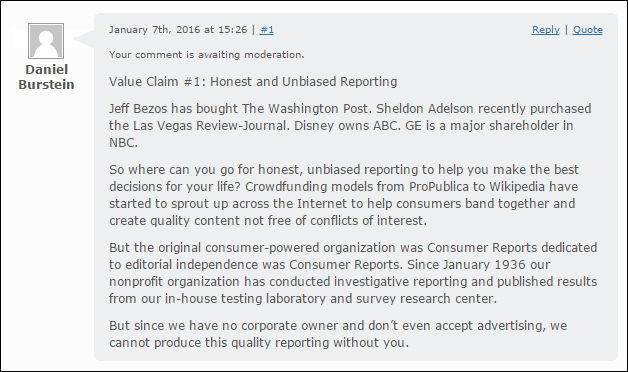 Process-Oriented: Not having to rely on advertisers or corporate funding allows Consumer Reports (CR) to deliver honest reporting. Process-Oriented: Trusted, high-quality research is powered by the largest consumer advocacy group in the world, Consumer Reports. Consumer Reports has 60 labs, plus its own auto track used to conduct its testing. CR rates nearly 4,000 products and services each year. There are nearly 300 CR staff members involved in testing, researching, and reporting on all of these products and services. This includes, to name a few, individual testers, scientists, doctors, writers, editors, proofreaders, statisticians, web developers, and market researchers. Outcome-Oriented: The research and testing conducted by Consumer Reports has a direct impact on the safety and quality of life for millions of people. One of the benefits of this test for our nonprofit partner, Consumer Reports, is to discover new Value Focuses it might not have previously considered. We know this large focus group of experienced copywriters and marketers may be able to identify a Value Focus we’ve overlooked. Plus, you’re creative folks. 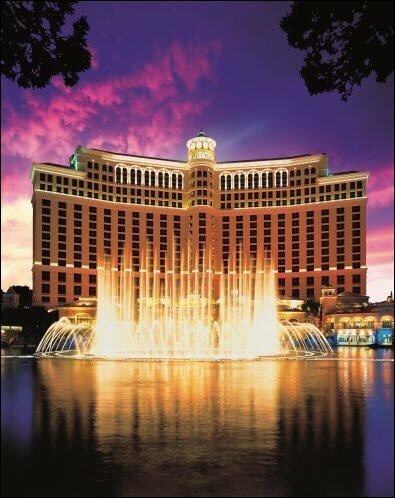 We didn’t want to stop you from using a good idea you had by imposing too much structure. If you choose to enter with your own Value Focus, just let us know you’re entering Value Focus #4 and tell us what it is, along with the actual copy you write for the email that messages your Value Focus. The treatments will have the same subject line, from field, preheader, imagery, and template. 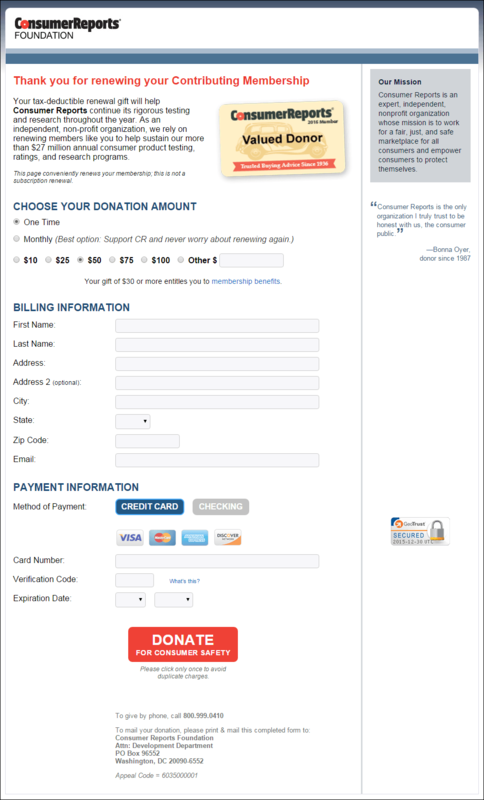 The call-to-action copy in the body will also be very similar. The only factor that will be significantly different will be the value proposition messaging you write at the beginning of the email.